Before the AGM, Ron Foulkes from Countess Mountbatten Hospice gave a moving talk about the work of the hospice to relieve the suffering of patients and their families. The patients mostly have terminal cancer. Ron is grateful that the hospice has been chosen by HWA for our charitable donations this year. Some members had brought turned items for donation at this meeting to get the programme under way. There will be plenty more opportunities to do so at future meetings. The AGM started with approval of the minutes of last year’s meeting which had been published in the Spring issue of Your Turn. Jon Gibbs, the outgoing chairman read his report, which is printed separately in this issue as is a summary of the treasurer’s report from Alan Sturgess. 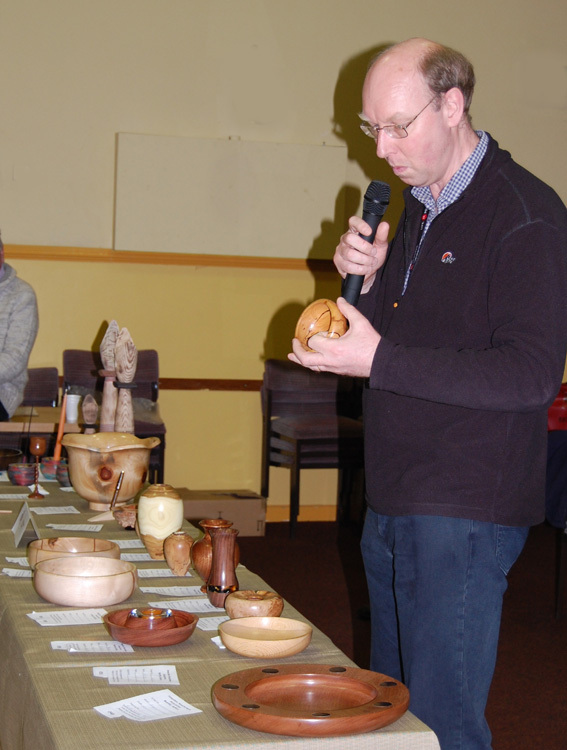 Jon’s penultimate task was to present the awards. Phil Bristow has made his mark with some skilful turning which belies his inexperience and was clear winner of the Les Revell trophy for novice of the year. Harry Woollhead unfortunately could not be present to receive his trophy as member of the year. This award is always a difficult decision for the committee and this year was no exception. It went to Harry for his efforts in reviving the novice group with a welcoming low-key style and the Saturday hands-on days. 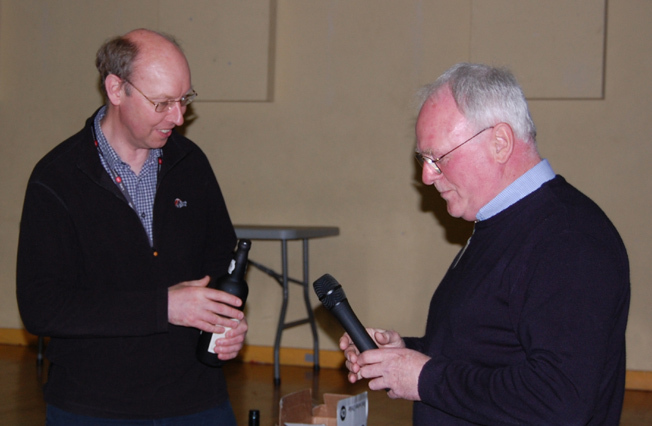 The efforts of the helpers making up what is sometimes called the extended committee were acknowledged in the traditional manner by awards of bottles of wine. Without the contribution of these people the Club could hardly function at all. Chris Davey temporarily took over the chair for the election of officers and committee. Jon’s term of 3 years as Chairman is over and he’s also moving away to Cumbria. He has promised to keep in touch and we really hope he does. John Holden stood as the new Chairman and was unanimously elected. 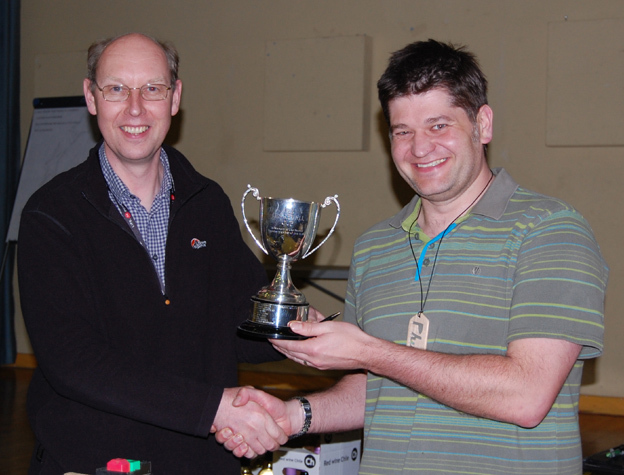 Also moving on is webmaster Dan Would whose valuable contribution was acknowledged by Jon. 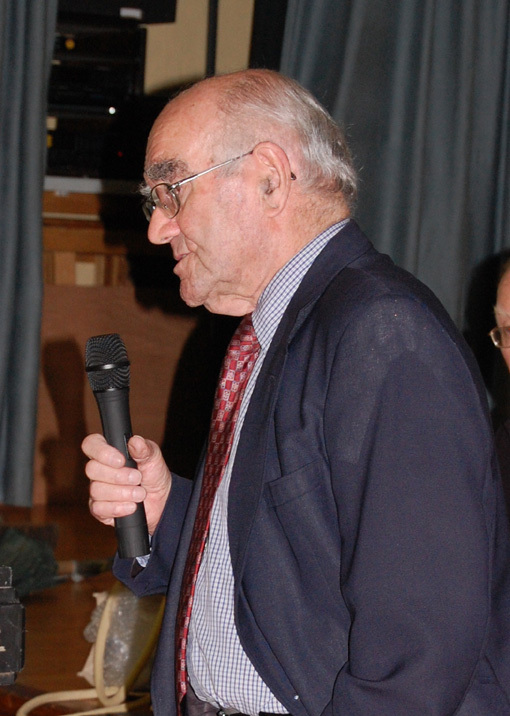 Phil Bristow stood for the committee to take over the role and was duly elected. Martin Stallard also stood down. The remaining officers and committee members stood again and were duly elected. The new committee is listed on the “contact us” page. Before handing over, Jon expressed his anger at the news that some items were stolen from the shop and John Davis’s Sorby sale at the March meeting. We take an atmosphere of trust in our members for granted and it is sad that this view is now challenged. Whoever was responsible is not welcome at the Club. New chairman John Holden took over and thanked Jon for steering the Club through a difficult period. Membership has stabilised and even growing again and the atmosphere is more friendly. An unexpected gift of a bottle of wine was made with a request to do a critique on the members’ gallery as a final task. 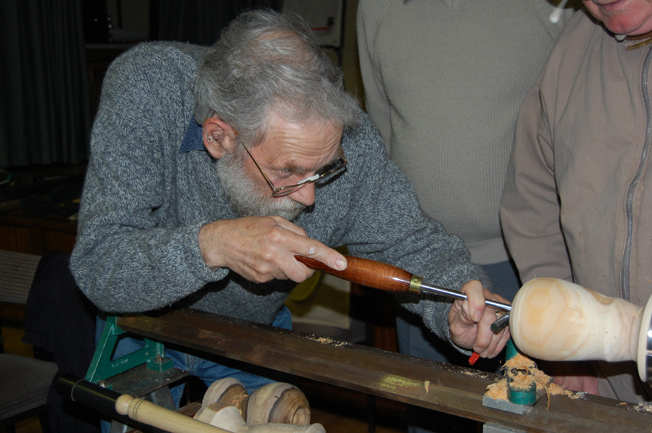 Before that, 2 lathes had been set up to allow members to try their hands with various hollowing tools that had been brought along by Alan Sturgess and Dave Gibbard. 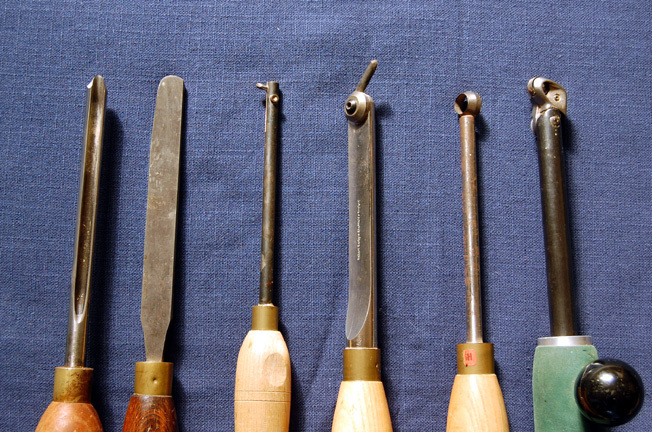 With practice surprising results can be obtained with traditional gouges and scrapers but for more extreme hollowing, special tools are required. Originally these were simply long rods with adjustable scraping tips and these are still available but the newer and inevitably expensive ones are cutters. These are like ring tools with the addition of an adjustable shield to define the depth of cut. Jon then took advantage of his pending exit to put the crit into critique as he reviewed the gallery items. Favourite targets were unfinished bases still showing chucking marks and curves which were not continuous. I agree entirely about the curves (though I was personally guilty of a hint of a bulge). But the real purpose of a chucking recess is lost on the buying public if finished neatly and may not look out of place. I wish Jon and his family a great future in the delightful Lake District and look forward to some exquisite Cumbrian curves in his work.